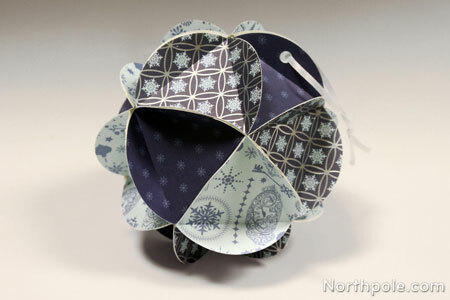 We elves love paper crafting, and this super cute icosahedron is fun to make. You can switch up the size of the circles to make this ornament smaller or larger. 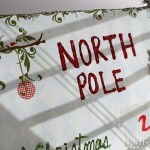 Jumbo-size it for a ceiling decoration! 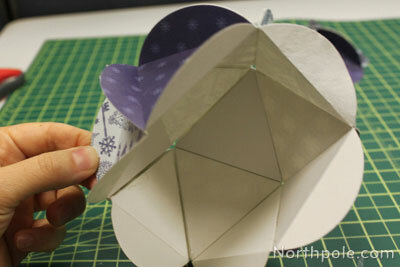 Instead of buying new cardstock, try making this craft from old Christmas cards, gift bags, or even gift boxes. 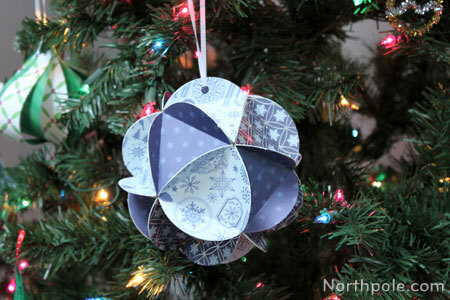 When choosing paper, we recommend selecting 3 different colors/prints to highlight the many surfaces of this unique ornament. 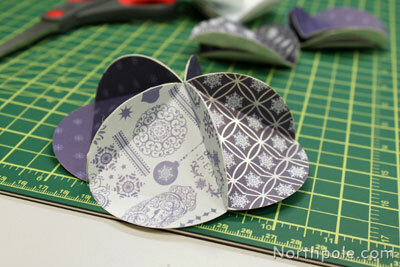 Cut out 20 circles using the circle punch. We cut 6 dark blue, 7 medium blue, and 7 light blue circles. 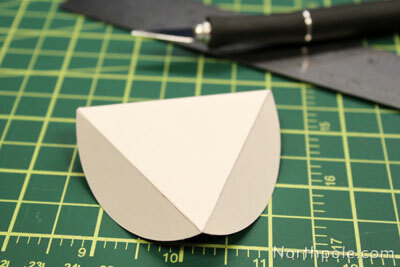 Print the triangle template and cut out. 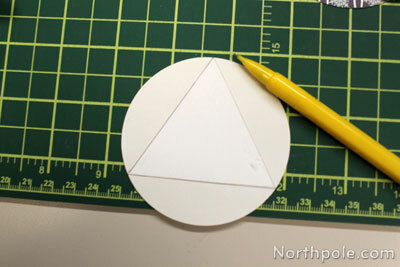 Using the triangle template, draw an equilateral triangle on the unprinted side of each circle. The corners of each triangle should touch the edge of the circle. 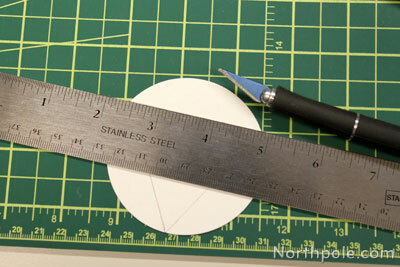 Using a ruler and X-Acto on a cutting mat, score the lines of the triangle. This will make it easy to make a clean fold on the circle. 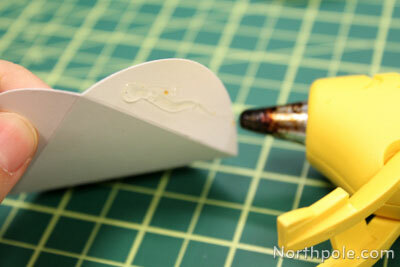 Be careful to gently score the paper; you do not want to cut all the way through the paper. Fold along the score line, printed side facing in. Repeat steps 3–5 for each circle. 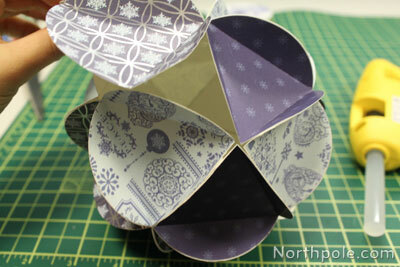 Begin gluing the pieces together. Using the hot glue gun, put a small amount of glue on the unprinted side of tab of one circle, and immediately press the tab of another circle. Glue 5 circles together. 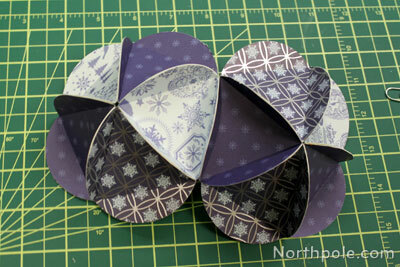 Notice how the corners of each piece join together, making a star-like shape. Set aside. Glue another 5 circles together in a star-like shape. Glue one tab from each set together. 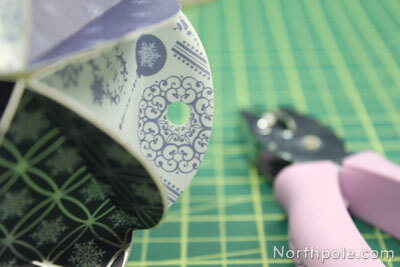 Using the one-hole punch, make a hole in one of the tabs. 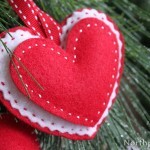 Cut a piece of string or ribbon and use to hang the ornament. 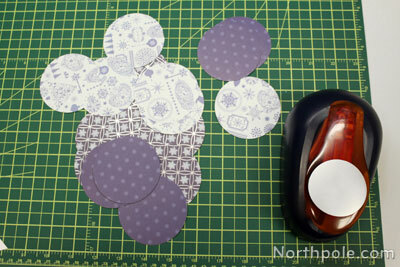 Cut out 20 circles using the circle punch. Place the triangle template on the right side of the circle. 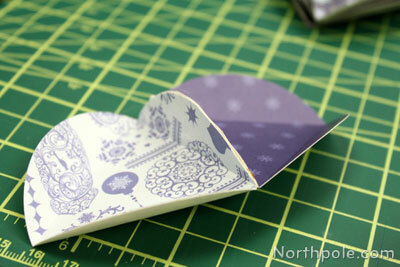 Using a bone folder, score the circle and fold the tabs inward.